Karen Macklin interviews Temple of Poi Founder, GlitterGirl, in this 5 page feature and cover story. Feature interview on GlitterGirl and hooping. 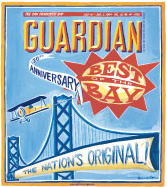 Named Best Place to Learn Fire Dancing Before Burning Man in Best of the Bay Awards. Finalist in COL5 video compilation. GlitterGirl was featured as part of this book about transitions and time off.